To start the investigation of Earth's energy balance, you will begin by taking an in-depth look at a familiar process known as the water cycle. Earth's water supply is recycled in a continuous process known as the water, or hydrologic hydrologic cycle: the process of evaporation, vertical and horizontal transport of vapor, condensation, precipitation, and the flow of water from continents to oceans., cycle. Water molecules continuously move from location to location in this cycle. 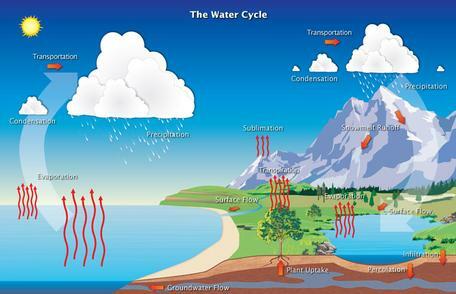 The water cycle is important to weather and climate and, ultimately, to all life on Earth. The water cycle is driven primarily by the energy from the sun. This solar energy drives the cycle by evaporating water from the oceans, lakes, rivers, and even the soil. Other water moves from plants to the atmosphere through the process of transpiration. As liquid water evaporates or transpires, it forms water vapor and clouds, where water droplets eventually gain enough mass to fall back to Earth as precipitation. The precipitation then becomes run-off or ground water, and works its wayover various timescalesback into the surface reservoirs. The water cycle is essentially a closed system, meaning that the volume of water that is in the hydrosphere today is the same amount of water that has always been present in the Earth system. Begin this lab by watching the following short NASA animation demonstrating the path of one water molecule through the water cycle. While watching the animation, make a list and keep track of all the places that the molecule travels. Note: In the NASA animation, the depiction of the water reservoirs, such as underground aquifersaquifers: underground water reservoirs that form in the spaces and cracks between rocks, sand, or gravel, where water travels relatively easily., has been simplified to show the molecule pathways. Click Water Cycle Animation to view the animation in a new window. As discussed earlier, the water cycle not only redistributes water around Earth, it also absorbs and redistributes solar energy between locations. Latent heatingLatent heating: the energy required to change a substance to a higher state of matter (solid to liquid, or liquid to gas). This same energy is released from the substance when the change of state is reversed (gas to liquid, or liquid to solid). of Earth's atmosphere occurs as energy, primarily from the sun, causes liquid water to transform to another phase. As this occurs, liquid water absorbs energy, causing it to evaporate and form water vapor. The process of evaporation absorbs tremendous amounts of incoming solar energy. Through the process of latent heating, energy is transferred into the atmosphere when the water vapor condenses during the formation of clouds. For example, think of how a puddle, following a rainstorm, keeps a sidewalk cool until it is completely dried by the sunshine. The incoming solar radiation is being used to drive the process of evaporation. Once the water is gone, the sidewalk begins to absorb solar radiation and heat up. If you touch the sidewalk with bare feet you can feel this sensible heatsensible heat: the excess radiative energy that has passed from Earth's surface to the atmosphere through advection, conduction, and convection processes..
A second mechanism for the redistribution of thermal energy is the process of convectionconvection: the transfer of thermal energy by the movement of heated material from one place to another., which is the driving force behind weather. Together, these two processes account for a significant amount of the Earth's radiation budget. In total, energy leaves Earth's surface through three processes: evaporation and condensation (or latent heating and cooling), convection, and emission of thermal infrared radiation. Of these three processes, 25 percent of the energy that leaves the surface of the Earth is through evaporation and condensation. An additional five percent, leaves the surface through convection. As you complete the following lab, look for signs of these two important heat transfer processes. 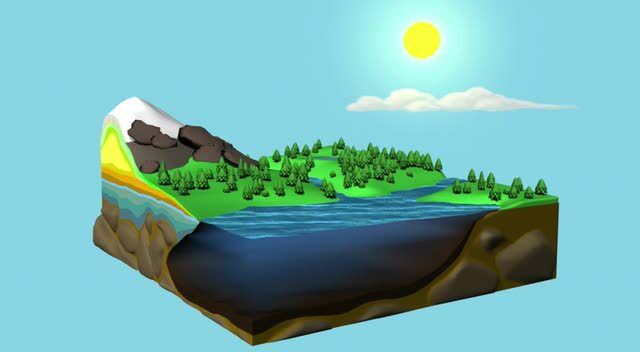 In this lab you will build a physical model of the hydrologic, or water cycle. Rubber bands to hold the plastic wrap in place, if used. Hint: Tie several shorter rubber bands together to make one large one. Light source: bright sunlight or lamp (40-60W). If using a lamp, desk or clamp-on type lamp works best. Set up the equipment as show in the figure, right, or picture below. In the image below, the set up has been modified to include a small jar lid to catch the precipitation. Note the plastic wrap "lid" of the container is placed loosely on the box and held in place with rubber bands. A ziplock bag has been substituted for the insulated cup. Cut a hole large enough to fit the insulated cup in the "lid" of your aquarium or clear plastic shoebox. Or, if you are using plastic wrap, you can just place the ice in a baggie and put it directly on the plastic wrap cover. Add enough water to fill the container with water to a depth of 2-5 cm. Optional: Add several drops of food coloring to make it easier to see the water. Position a bag of sand or gravel at one end of the aquarium. The sand / gravel should be above the water level. Add a small jar lid or bowl to the "land area" on top of the sand and under the ice. Fill a cup or ziplock bag with ice and place it in the opening in the lid (if using cardboard) or on top of the plastic wrap. Place a focused lamp, such as a desk lamp, so that it heats the water at the other end of the aquarium or box. 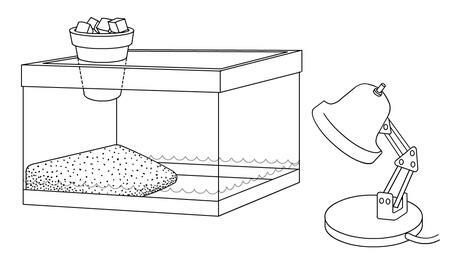 If the lid of the box is clear, shine the light through the lid; otherwise aim it at the water through the side of the aquarium. Turn on the lamp, or place the apparatus in the sun, and watch the water cycle occur. Once you have completed this lab answer the Discussion and Stop and Think questions below. Once you have produced your water cycle model, critique its effectiveness and validity. Which parts of the water cycle were clearly demonstrated with this lab and which parts were not well represented? How might you document and share your demonstration with other students? Draw a sketch of you water cycle model and add words to describe the processes taking place in the model. Relate each part of your model to the water cycle diagram at the top right of this page. For example, the lamp represented the sun. What other Earth system processes were demonstrated in this lab? What was the energy source for the water cycle? How does the water cycle "transport" energy? What do you think would happen if you added a second or even third lamp? 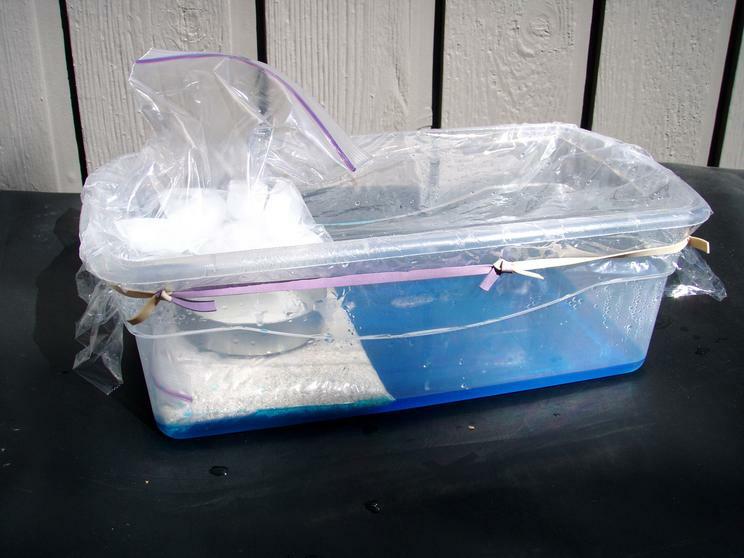 Describe what you think would happen if you left the water cycle in a shoebox in the dark for several hours. NOAA Jetstreambackground information about the water cycle and its role in weather and climate.